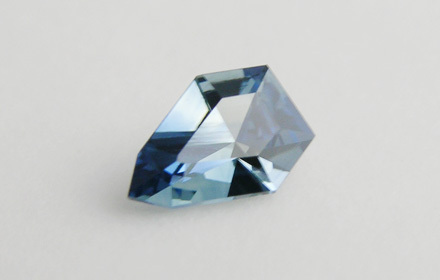 Weight: 0.27 ct; size: 3.81 | 5.26 | 2.22 mm; shape: shield; colour: medium very strongly greenish blue; very slightly greyish; clarity: eye clean; cut: excellent; treatment: none. Very clean specimen; design ‘Clipeus S’ [crown angle changed to 25.00], excellent cut by Tan Pen. Most commonly refers to a blue gem variety of corundum, but other coloured varieties of corundum are also described as sapphire, except the natural red.